Does it really work? Listen to Nemo’s short rant and learn if it does. Bracketron’s “universal” iPad and tablet auto headrest mount clamps an iPad in place, then (is supposed to) with two snap-hooks lock the plastic mount to a car’s headrest posts. The $40 US price is reasonable if your car is compatible. 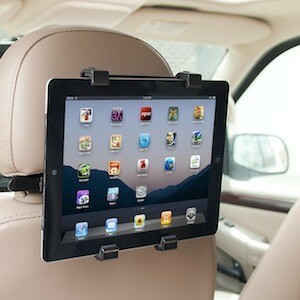 This entry was posted in AppMinute Podcast and tagged in Bracketron, DriveSlim, iPad, Prosoft Engineering, Universal Tablet Auto Headrest Mount.